I’ve got a thing for stuffing delicious things into chocolate cups. See for example: Chocolate Chip Cookie Dough Cups. Chocolate Pretzel Peanut Butter Cups. Chocolate Strawberry Cups. 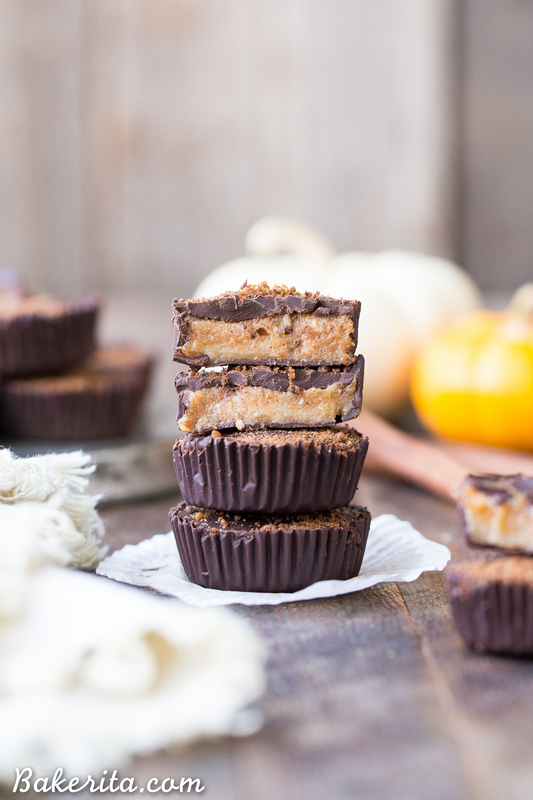 Chocolate Peanut Butter Cups. Chocolate Peanut Butter & Jelly Cups. Sensing a theme here? Clearly I like delicious things stuff into cups of dark chocolate. 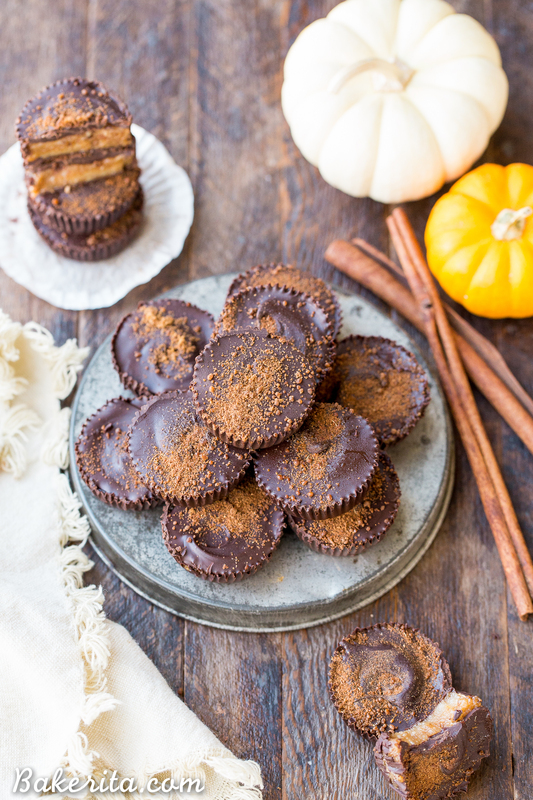 With my cup making tendencies, I couldn’t let pumpkin spice season pass me by without making a delicious spiced pumpkin cup, with a melt-in-your-mouth chocolate coating and a gooey, warmly spiced, pumpkin & maple syrup filling. The resulting chocolate pumpkin spice cup is the stuff of pumpkin spice lover’s DREAMS! 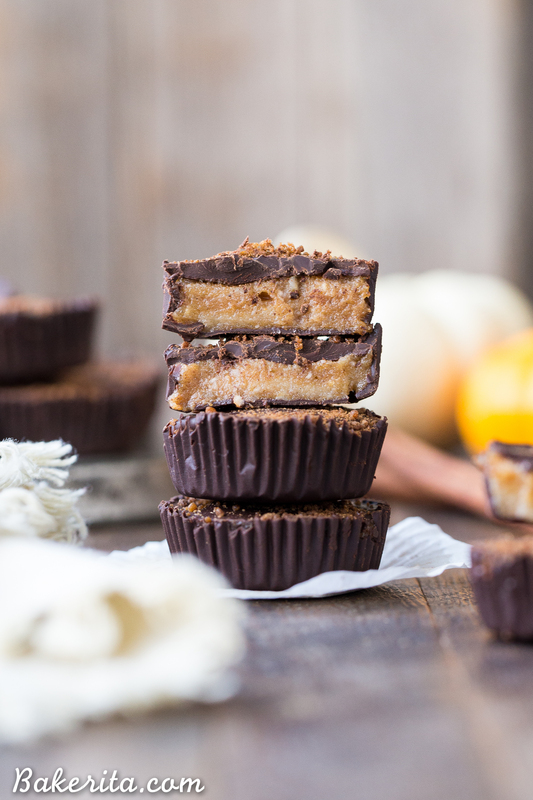 If you or someone you love goes nuts for everything pumpkin spice this time of year, you owe it to yourself/them to whip up a batch of these scrumptious cups. First let’s talk chocolate! I love making my own chocolate for cups using the same chocolate recipe I use in my homemade paleo chocolate chunks. Since the base of that chocolate is coconut oil, the chocolate just melts in your mouth in the most delicious way. It does melt at a lower temperature though, so if you’d like more shelf stable cups, you can use melted chocolate chips or chunks instead. Since they’re made with cocoa butter, the melting point isn’t as low. Now for the good stuff – the heavenly pumpkin spice filling!!! The base is a combo of coconut butter and cashew butter. I like the combo because the coconut butter provides a little firmness and stability so it’s not too drippy, while the cashew butter adds a buttery richness to the table. A little maple syrup, the perfect flavor pairing with pumpkin + spice, is added to sweeten a bit. Besides that, we’ve got the pumpkin goodness: pumpkin puree and pumpkin spice! I used a pretty hearty dose of pumpkin spice because hello? Tis’ the season. When it all comes together, you’ve got a spiced, caramelly mixture that tastes like fall. The cinnamon and nutmeg from the pumpkin spice, paired with the organic pumpkin puree and the sweet maple syrup, creates a combo that will rival a peanut butter cup anytime. <– that’s big talk coming from a PB lover like me! These also couldn’t be easier to make. Both the chocolate and filling come together in a flash, so truly the hardest part is putting the cups together, and that doesn’t take long either! I used a mini muffin pan, but you can use a mold if you have one (like this) or a regular cupcake pan with liners (they’ll just be bigger). Whichever way you decide to make them…enjoy!! 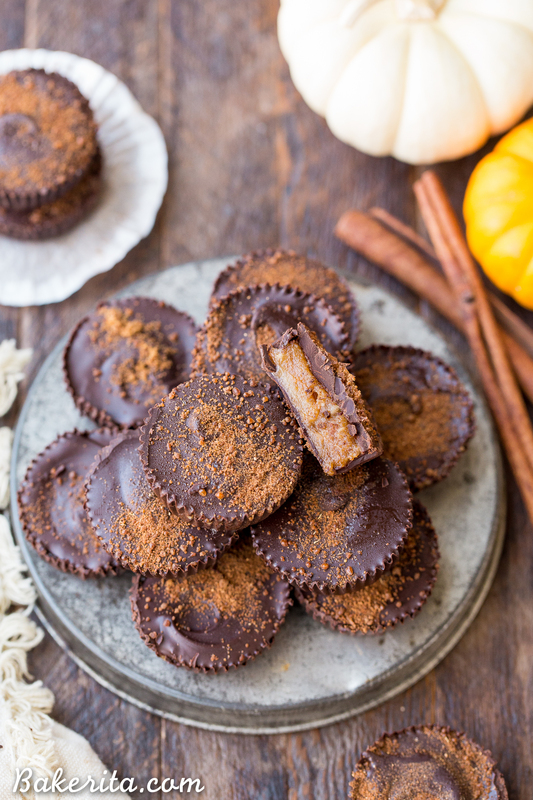 These Chocolate Pumpkin Spice Cups are a gooey, pumpkin spiced twist on the more traditional chocolate cups you know and love. 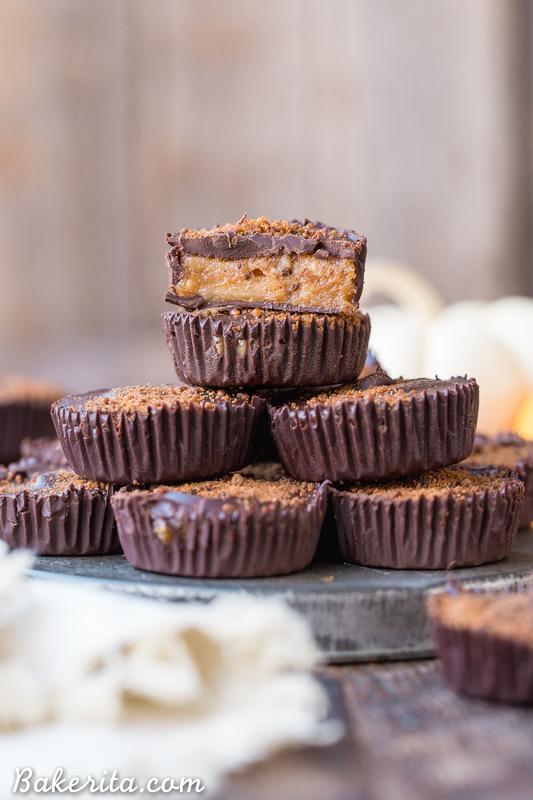 You're going to go nuts for the spiced, caramel-like filling in these gluten free, paleo, and vegan pumpkin spice cups. Line a mini muffin tin with small cupcake liners. Alternatively, you can also use a peanut butter cup mold, which is what I used. Pour a small amount of the chocolate mixture into the bottom of each liner or mold cavity, until the bottom is thinly covered. Swirl the chocolate around or use your fingers to spread it onto the sides of the liners too. Don't use more than half the chocolate mixture for this. Place the liners in the refrigerator for about 10 minutes to harden. While the chocolate hardens, stir together the melted coconut butter, cashew butter, 2 tablespoons maple syrup, pumpkin puree, and pumpkin spice. Once the bottom layer of chocolate is hard, place about 1 heaping tablespoon of the coconut butter mixture over the chocolate. Pour enough of the chocolate mixture over the coconut butter to cover it completely (if at any point the remaining chocolate gets too thick, warm it in the microwave for 10-15 seconds to remelt). Repeat until all are covered in chocolate. Garnish as desired - I sprinkled on a mixture of coconut sugar and pumpkin spice. Return to the refrigerator to harden completely. Store at cool room temperature, or in the refrigerator if you live in a warm climate. Yayay going to start trying to include them on more recipes, I hope you love these Amber!! At what point to you add the chocolate to the side of the paper cup. Your pictures show not just chocolate on the bottom and top, but also on the side. Just curious. Would like to try them. Hi Marlis, thanks for pointing that out! I realized I was totally unclear in the instructions, and they’re all fixed now :) enjoy! Thank you so much for takin the time to explain further. Hi Teresa, thanks for catching that! It’s fixed now – I had forgotten to list it with the filling ingredients. Hope you love them. These look delish! You have cashew butter listed in the ingredients, but I don’t see them in the instructions. Did I miss something? Thank you! Oh my gosh, these are so tasty! The cocoa powder was a bit bitter, so I used ¼ cup of syrup, and margarine instead of coconut oil, but it came out a little lumpy instead of melty. Glad to hear you enjoyed them, Corinne!